Septic shock is a clinical syndrome that is difficult for a variety of infectious diseases, is characterized by a sharp decrease in metabolism and energy production as a result of disorders of microcirculation in tissues and organs in violation of their functions and structures. In obstetric practice, it can complicate the course of post-partum and post-abortion septic diseases, chorioamnionitis, operations on the pelvic organs, mastitis, pyelonephritis, and others. Septic shock occurs in 3 — 15% of patients with postpartum and post-abortion septic diseases. In terms of frequency of occurrence, he is in third place after hemorrhagic and cardiac, and on mortality — on the ground (killed by 20 to 80% of patients). 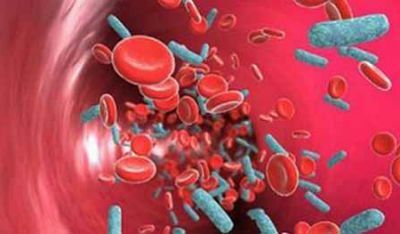 The most common cause septic shock, gram-negative microorganisms: Escherichia coli, Proteus, Klebsiella, Pseudomonas aeruginosa, and various combinations thereof. With the destruction of the bacteria endotoxin is released, which is the leading pathogenetic factor in the development of shock. Septic shock occurs acutely, more often after surgery or manipulation in the foci of infection, creating the conditions for a «breakthrough» microorganisms or their toxins in the bloodstream of the patient. In the case of accession of liver failure the skin becomes jaundiced. Acrocyanosis, petechial rash on the chest, abdomen, on the flexor surfaces of the extremities occur at a later date. The ineffectiveness of treatment and the severity of organ damage in the future cause the development phase of the refractory shock and death of the patient. In previous years, the highest death rate from septic shock was observed in the first 24 hours. Currently, most patients survive the acute phase, but some of them die within a few days as a result of associated complications or, less frequently, by superinfection. Septic shock is a mortal danger to the patient, so it is important early diagnosis. The time factor in this type of shock is crucial, as irreversible changes in the body occur early, within 6 -. 12 hours Diagnosis is mainly based on clinical manifestations. Intensive therapy carried the obstetrician-gynecologist in conjunction with resuscitation, if necessary, with a nephrologist, urologist and hematology-coagulation. The main urgent measures in septic shock is intravenous catheter for immediate infusion of therapy, the introduction of nasal or tracheal catheter for a thorough toilet of the tracheobronchial tree, bladder catheterization to monitor urine output. For removing the patient from a state of shock efficient use of high doses of corticosteroids. Simultaneously administered 500 mg of hydrocortisone or prednisolone and 120 mg, or 16 mg of dexamethasone. After 2 — 3 — 4 hours, repeated administration of the drug. The most important component of resuscitation in septic shock is fluid resuscitation (reopoligljukin, polyglukin, gemodez, Ringer’s solution, glucose, sodium bicarbonate, laktosol). Its purpose — replenishment bcc, normalization of blood rheology, microcirculation, detoxification and correction of metabolic disorders. The rate and extent of infusion therapy depends on its effectiveness, and the reaction of the body of the patient. In shock I infusion total degree of 1000 — 1500 ml at 200 ml / h, II degree — 2000 — 2500 ml (350 ml / h), III degree — 3500 — 5000 ml (500-600 ml / h). One of the components of the complex treatment is antibiotics. Highly recommended initial dose of antibiotics to quickly achieve their concentration in the blood. Since treatment in the early infectious agent, septic shock caused, unknown, 2-3 prescribe an antibiotic based on their action not only on gram-positive and gram-negative, aerobic and on and anaerobic flora. At least two antibiotics are administered intravenously prolonged perfusion. Improvement of exchange and stimulation of regenerative processes promotes the use of extracorporeal UFO blood of patients with «Isolde» apparatus, extracorporeal hemosorption and hyperbaric oxygenation. Infection control includes the elimination of hearth uterine infections, abscesses and draining their wide drainage. According to the majority of domestic and foreign authors, the operation should be used when the failure of intensive conservative therapy, carried out for 4 — 6 hours, a-, in some cases — immediately after cupping phenomena vascular collapse. Surgical intervention should be carried out regardless of the condition of the patient. The sooner it is implemented, the better long-term results, «Delaying surgery for 24 hours in most cases leads to death. The criteria for the effectiveness of complex treatment of septic shock are to improve patient consciousness, disappearance of cyanosis, warming, and the pink color of the skin, reducing tachycardia and dyspnea, CVP and blood pressure normalization, increased diuresis, elimination of thrombocytopenia and normalization of blood coagulation. Targeted antibacterial, detoxification and hemostimulating therapy, replenishment of energy resources and improving their own defenses, CBS and electrolyte homeostasis normalization should continue until the complete elimination of infection. After discharge from the hospital the patient for 5 years requires dispensary observation for timely detection and treatment of possible long-term consequences of suffering septic shock: chronic renal failure, Sheehan syndrome, diencephalic syndrome by type of Cushing’s, diabetes, adrenal cortex necrosis syndrome.